NEW YORK—When the outcome of a story is known to the audience long before the curtain even rises, the journey itself and the characters who make that journey become critical. It is the journey and characters we enjoy in the Broadway musical “1776,” a rousing concert version performed recently as part of the New York City Center’s Encores! series. It’s late spring of the title year and the relationship between the British Crown and their 13 American colonies has been strained to the breaking point. Edicts from the mother country, including the Stamp Act and the Tea Act, have led to incidents of rebellion in the New World. Among them have been the Boston Tea Party and armed clashes at Bunker Hill, Lexington, and Concord. With these events as a backdrop, the action takes place mainly at the Second Continental Congress in Philadelphia. 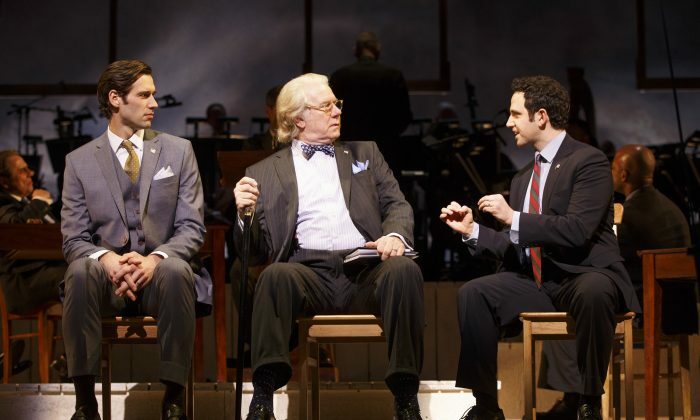 The musical details the efforts of John Adams (Santino Fontana) and his congressional allies, among them Benjamin Franklin (John Larroquette) and Thomas Jefferson (John Behlmann), to convince the colonies to officially declare their independence from Great Britain and form a new nation. Their efforts are stymied by the more conservative factions of the Congress. John Dickinson (Bryce Pinkham) of Pennsylvania is extremely proud of being part “of the greatest nation on earth.” Samuel Chase (Ric Stoneback) of Maryland sees any rebellion against Britain as nothing short of disaster. And Edward Rutledge (Alexander Gemignani) of South Carolina is concerned whether the sovereign rights his colony now enjoys will be respected by this new government, when and if it actually forms. While everyone is familiar with what happened, along with when and why, the how of the matter is not always that clear. “1776” offers a brilliant take on that question, one with some lessons that are all-too-relevant for today’s political climate. The entire process revolves around the fact that politicians, despite their posturing, never get exactly what they want without compromise. It is especially true in this case, for when a measure is proposed and accepted, any vote taken on independence must be unanimous. The action takes place mainly at the Second Continental Congress in Philadelphia. Compromises, no matter what form they take, are the way things most often get done—whether in politics, business deals, or any form of mutual agreement. It’s a truism that the current lawmakers in both parties would do well to notice. The “1776” audience certainly did. The lines in the show about government stagnation got some pretty big laughs. Other historical tidbits tossed in include New York’s constant abstention on the vote—in reality, the delegation received no instructions from their legislature regarding the matter. Also, if Franklin got his way, the national bird of America would have been the turkey, instead of the eagle. Along the way we hear many of the famous quotes and sayings by the principals. “1776” is an oddity in that while it is indeed a musical with such stirring numbers as “For God’s Sake, John, Sit Down” and “He Plays the Violin,” there are large swaths of text with no songs whatever. Indeed there are times we can get so engrossed in the tale that we forget this is a musical at all. Yet this juxtaposition works quite wonderfully. The show’s creators used songs when they needed to work in emotional layering of the characters or make a particular dramatic point and let the gripping story stand on its own whenever possible. Other highlights of the score include “Till Then” and “Yours, Yours, Yours.” Both tunes illustrate the deep emotional bond between Adams and his wife, Abigail (Christiane Noll). In the same vein, “He Plays the Violin” helps to show the closeness between Jefferson and his wife, Martha (Nikki Renée Daniels). There’s also the very enjoyable “But, Mr. Adams,” which details how Thomas Jefferson was ultimately selected to write the Declaration of Independence, and the bitterly ironic “Molasses to Rum,” quite powerfully sung by Gemignani. This last number received one of the biggest applauses of the performance, which takes full aim at the hypocrisy of the so-called progressive North and its own role in the infamous Triangle Trade. The cast threw themselves enthusiastically into their roles. “Molasses to Rum” takes the narrative back to the need for compromise, even when it seems almost unthinkable to do so. For it becomes evident to Adams and his allies that in order for the proposal of independence to be adopted, any thought of outlawing slavery in the hoped-for United States of America will have to wait for another time. Direction by Garry Hynes, music and lyrics by Sherman Edwards, and book by Peter Stone for the Encores! presentation was quite good. The cast threw themselves enthusiastically into their roles and only occasionally referred to the script. Fontana was perfectly on point as the firebrand Adams; Larroquette presented a nice portrayal of Franklin, someone often jovial and always ready with a quip or cutting comment, yet also clearly made of sterner stuff. Behlmann was nicely subtle, almost an enigma at times, but ultimately quietly steady as Jefferson. A lot has been mentioned in regard to the production’s decision to go the nontraditional casting route. The effect here was mixed at best. While there are clear advantages to the practice in general, when it comes to actual historic figures, there should be a specific reason for doing so—other than simply the fact that it can be done. To that end, while Jubilant Sykes makes for a good Richard Henry Lee, his performance brings nothing special to the role of the Virginia aristocrat. The same point goes for André De Shields in the role of an aging congressional delegate from Rhode Island with a fondness for rum. However, Ms. Daniels’s presence in the role of Martha Jefferson does lend an extra bit of poignancy to her scenes. This is due to the fact that Jefferson, despite stating he was against slavery, did own of a number slaves throughout his lifetime. The same impact holds true for John-Michael Lyles, who plays a courier for the Continental Army. The character fights in a conflict that will not grant him any unilateral rights as a citizen when the battle is won. All told, the Encores! production of “1776” was involving and moving. A nice touch are the mini-bios in the show program for each of the characters portrayed on stage. This information helped to give a more well-rounded view of many of the figures, particularly those who had almost no lines in the show. All told, the Encores! production of “1776” was involving and moving. The presentation was helped along by a calendar on one side of the stage, which counted down the days to July 4. A voting board on the other side showed the changing positions of the various colonies as to whether or not they were in favor of independence. That the proposal would ultimately carry the day is a historical fact. Exactly how all the votes ultimately became affirmative is another story altogether, and one that was told here well indeed. Also in the cast are Michael McCormick, Terence Archie, Wayne Pretlow, John Hillner, Jacob Keith Watson, Tom Alan Robbins, Laird Mackintosh, Michael Medeiros, Larry Bull, Kevin Ligon, Nicholas Ward, John Hickok, Robert Sella, MacIntyre Dixon, and Vishal Vaidya.